Prime Minister Stephen Harper is expected to rise in the House of Commons and deliver the government’s plan to contribute to the international mission against the Islamic State in Iraq. Harper’s speech will touch on both counter-terrorism and humanitarian operations, according to statement released Thursday night by his office. Harper will speak under the portion of Routine Proceedings known as "Statements by Ministers." 33. (1) On Statements by Ministers, as listed in Standing Order 30(3), a Minister of the Crown may make a short factual announcement or statement of government policy. A Member from each of the parties in opposition to the government may comment briefly thereon. The time for such proceedings shall be limited as the Speaker deems fit. The House of Commons is expected to the debate the motion and vote Monday. The text of the government motion has been released. Canada will contribute to sir strikes for six months but not ground troops will be deployed. The targets are ISIL and ISIL-allied terrorists. ...including air strike capability for a period up to six months." Also includes "terrorist allied with ISIL." The motion also says the gov't "will not deploy troops in ground combat operations." Harper told a New York audience last week that Canada was considering an American request to contribute more military resources. It was later revealed that the Canadian government had taken the initiative in offering further assistance. The government announced in early September that several dozen troops would be deployed for 30 days to Iraq in a consulting role for local security forces battling the Islamic State of Iraq and the Levant (ISIL). Canada joined a United States-led coalition of western nations. Harper told reporters that Canada was not engaging in a “combat mission,” although the operation would not be without risk. While 69 personnel were deployed, Harper confirmed Wednesday that only 26 soldiers were on the ground in Iraq serving as military advisors. Known as Operation IMPACT, there have also been 25 flights carrying two million pounds of military supplies as of last Friday. One RCAF CC-130J Hercules transport aircraft and one CC-177 Globemaster III strategic airlifter (with 80 accompanying personnel) were tasked for the deliveries. Elsewhere today, Turkish parliamentarians have voted to authorize the use of force in both Iraq and Syria. And Australia has decided to join the air strike campaign, according to Prime Minister Tony Abbott. Harper: "ISIL’s words are matched by its actions. In the territory ISIL has occupied, It has conducted a campaign of unspeakable atrocities against the most innocent of people." Harper: "It has tortured and beheaded children. It has raped and sold women into slavery. It has slaughtered minorities, captured prisoners, and innocent civilians whose only crime is being or thinking differently from ISIL." for a Government decision to join our allies and partners: The United States, the United Kingdom, France, Australia, Denmark, Belgium, the Netherlands, Jordan, Saudi Arabia, Bahrain, The United Arab Emirates, And likely others, in launching air strikes against ISIL." Harper: no ground combat mission but Canadian Forces will continue to advise and assist security forces in Iraq. Along with the air mission, this will continue for six months. Harper: "Let me be clear on the objectives of this intervention. We intend to significantly degrade the capabilities of ISIL. Specifically, its ability either to engage in military movements of scale or to operate bases in the open. "Cette mission arrêtera la propagation de l’État Islamique dans la région…et diminuera de beaucoup sa capacité de mener des attaques terroristes à l’extérieur de la région. Pour être clairs, disons que cette interventionne permettra pas d’éliminer l’État Islamique,…ni de garantir automatiquement qu’une autre forme de gouvernance puisse prendre sa place en Irak ou en Syrie." Harper: "We will strike ISIL where – and only where – Canada has the clear support of the government of that country. At present, this is only true in Iraq. If it were to become the case in Syria, then we would participate in air strikes against ISIL in that country also." Harper: let me assure Canadians that the Government is seized with the necessity of avoiding a prolonged 'quagmire' in this part of the world. What are your thoughts on Harper's speech and the six-month Canadian contribution? Leave your comments! Harper: "We will soon bring forward additional measures to strengthen the ability of our security services to monitor aspiring terrorists. To, where possible, prevent their return to Canada, or to, where that is not possible, give greater tools to be able to charge and prosecute." Here is the full motion, once again. Harper: it has never been the Canadian way "to do only the most easy and praiseworthy actions, and leave the tough things for others." Harper: "If Canada wants to keep its voice in the world, and we should since so many of our challenges are global, being a free rider means you are not taken seriously." Harper confirms that the House of Commons will debate the motion on Monday. Be sure to watch live on-air and online with CPAC / www.cpac.ca / CPAC TV 2 GO. Opposition Leader Thomas Mulcair now speaking in response to Harper's statement. Mulcair says Harper has not outlined a broad strategic outline for the mission and has not answered basic questions. Mulcair: Canadians have their doubts. Conservatives are telling us the mission will be expanded. The prime minister is leaving open the question of engaging in Syria. Mulcair now citing Harper's support for the 2003 Iraq war while Canadian Alliance leader. Mulcair: Will Canada will be mired in a war we wisely avoided entering a decade ago? Mulcair: Canada's first priority should be humanitarian concerns, along with strengthening political institutions. Mulcair: the unrest will not end with another Western-led invasion. "Canada, for our part, should not rush into this war." Trudeau: Canada's role must reflect the broad scope of Canada's capabilities, and how best we can help. Trudeau: Canada can do more than offer a few "aging warplanes." Trudeau: "this prime minister has not been upfront with Canadians about his plans." Trudeau referencing the "false pretenses and flawed intelligence" of the 2003 Iraq war. Trudeau: cannot make the wrong decision now because the wrong decision was made then (2003)." 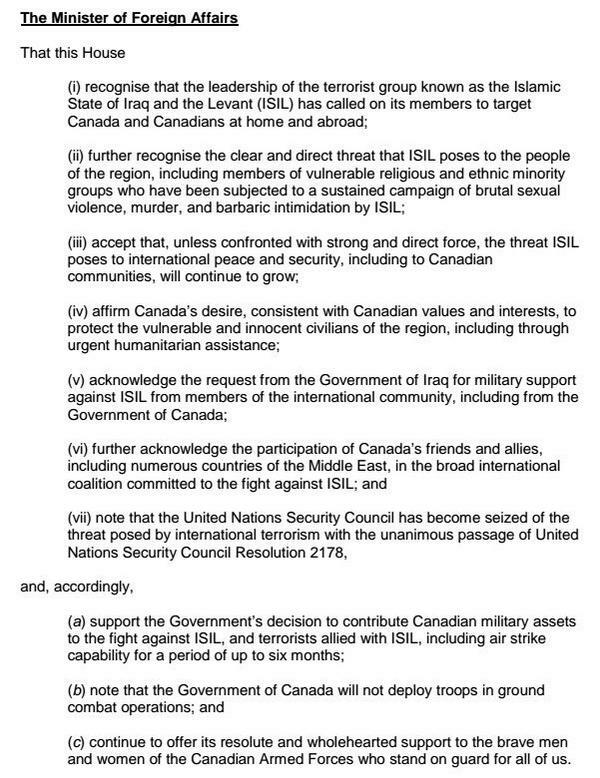 Witnessed an excellent speech in the House by @pmharper concerning proposed Canadian military engagement vs #ISIL. Looking fwd to debate. Trudeau: the Liberals will not support the government motion.